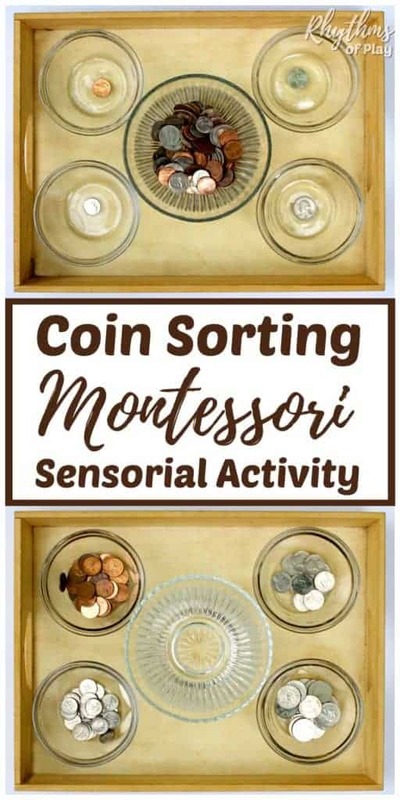 Coin sorting is a Montessori-Inspired sensorial activity. Montessori believed that kids learn about their environment and begin to understand it through the development of their senses. When children work with sensorial materials like coins or money, there is a “control of error” where they can check their own work without the need for a teacher. This helps children work independently and develop problem-solving skills. Activities such as coin sorting encourage children to focus attention on the sensory characteristics of the objects: visual appearance, textures, weight, dimensions, color, relative size, smells, tastes, and sounds. Sorting money helps children begin to make purposeful decisions based on the sensory information that they perceive. This decision-making activity helps establish new nerve pathways in the brain. Use glass bowls to increase the auditory component of coin sorting. Listening to my daughter sort money was like listening to music. As I listened it became easy to discern the difference between a penny and a dime based on the sound. The same experience happens for our children as they work without any “teaching” necessary on our part. Note: Please don’t give this activity to children that are still mouthing objects. Money is dirty and presents a choking hazard. If your child is ready to handle money independently, please wash the coins before allowing your child to sort coins. Wash the coins so they are safe for your child to handle. Money is dirty! 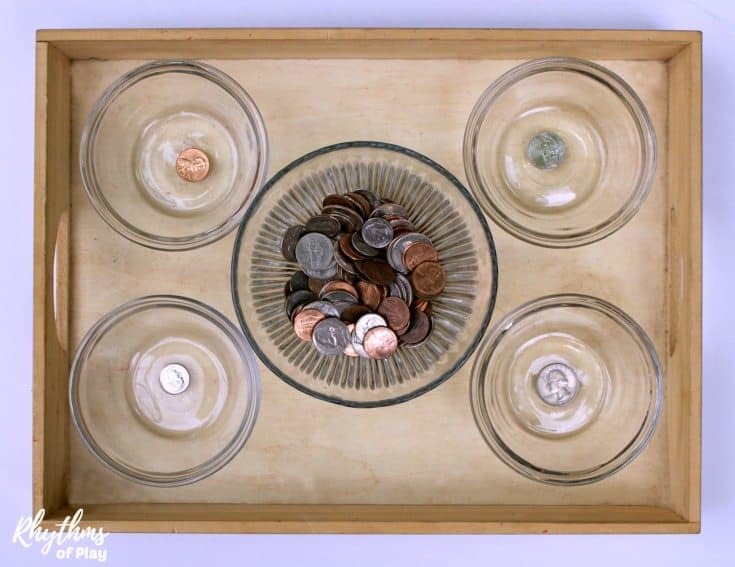 Place a bowl filled with all the coins in the middle of the tray or activity mat. Put 4 bowls around the center bowl filled with all of the coins. Drop a penny in the top left bowl, a nickel in the top right bowl, a dime in the bottom left bowl, and a quarter in the bottom right bowl. Have your child put on an apron as a signal that it is time to work. If this is the first time that your child has ever done this activity present it first. Show the child exactly what you expect them to do by silently and deliberately doing the activity in front of them for a minute or two. Show but don’t tell. Once finished. Place all coins back in the starting position shown in the picture shown below. Montessori activities are always done from top to bottom and left to right to prepare the child for reading and writing. This is why the coins are placed in the bowls in the order listed above and shown in the photo above. Another good way to do this activity would be to have the big bowl of coins at the top with the four little bowls below it or with the big bowl on the left with the four little bowls on the right. Make sure that you always place the money in the little bowls in order from smallest to biggest denomination from top to bottom or left to right. This helps a child’s brain forge nerve connections that prepare the child for academics. Working top to bottom and left to right make reading and math a whole lot easier! Place the materials in front of your child and invite them to sort coins. By working with sensorial materials such as coin sorting, children are given knowledge not through teaching, but by experiencing it for themselves. Observing, comparing, and sorting objects prepares children for the beginnings of logic, reason, and abstract thought. Montessori saw the importance of the manipulation of objects to aid children in better understanding their environment. She designed the sensorial exercises to cover every quality that can be perceived by the senses such as size, shape, composition, texture, loudness or softness, matching, weight, temperature, etc. Young children who do these activities find learning math and reading much easier. They develop visual acuity and discrimination that enable them to easily master letters and numbers when they’re ready. For more fun kids activities click HERE! Love the site! I’m seeing a lot of great activities! What age would this be aimed at please? This activity is aimed at children in preschool and kindergarten Jodie. With that said, please don’t offer this activity to children that are still mouthing objects.